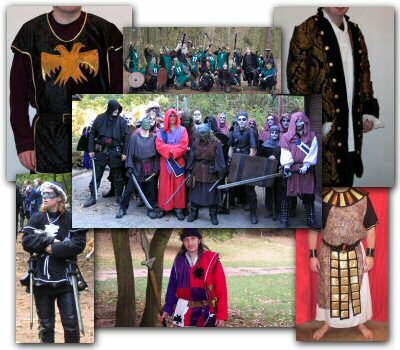 Welcome to Velvet Glove, the online costume shop, for all your LARP/LRP costume, LARP/LRP Armour, Re-enactment costume or Historical costume requirements. We have an extensive range of styles, designs and products and are always willing to undertake custom work to your specifications. Larpcon. We will be at our first event of the year on 1st - 3rd March.Hope to see you there. News We now have an leather sewing machine up and running, so there will be new leather items which will be added to the website over the winter. We will also be adding more 'by Velvet Glove' items such as waxed robes, raggy cloaks and much more. We will also be adding yet more items from our other suppliers and maybe some new suppliers as well. So lots to look forward to over winter. Please note Most of our items are made to order so please allow time for us to make your item when ordering. Our overseas goods are proving so popular they sell out fast. We are putting in regular orders with our suppliers and working on building up our stock levels, but please leave extra time when ordering, so that if they are out of stock, we can still get the items to you in time.